Pierre Boulez was born on March 26, 1925. Quite obviously my photo is not of Boulez, but this path leads to him. 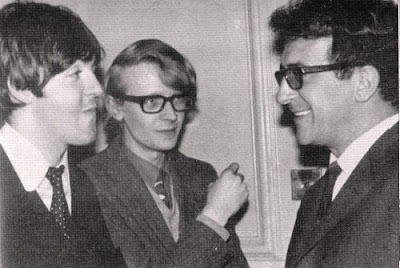 The photo was taken at the Italian Institute in London in 1965, Paul McCartney is talking to Luciano Berio and between them is Barry Miles who was a key figure in the 60s counterculture. The photo comes from Miles' memoir In the Sixties which places Berio, Cage and others alongside better known icons of the decade and is one of the best books on the period. Like so many good books today it is out of print, but is still available if you search. One of my favourite Berio CDs is the 1984 Erato recording of his Sinfonia with the New Swingle Singers and Orchestre National de France conducted by birthday boy Pierre Boulez. The Sinfonia is the composer's best-known work and blends Samuel Beckett, Martin Luther King, Claude Levi-Strauss and, of course, Mahler in Berio's unique style. Barry Miles went to Cirencester Grammar School where his music teacher was Peter Maxwell Davies. In the Sixties describes how Max invited older boys back to the converted apple loft where he lived to drink claret from eighteenth-century goblets, and how, when required to play the piano for the hymns at morning assembly, Max placed a lighted candelabrum on top in the style of Liberace. Miles' other books include an excellent biography of another counterculture figure Allen Ginsberg, read more here. Trivia - I notice that this is post number 1500 On An Overgrown Path. At a conservative estimate that is around 500,000 words. Which compares with 773,692 in the Bible. Which is where the similarity ends. Sixties hipsters had the rockingest glasses in history. People try to imitate that look today, but forget you need a scratchy-looking jacket to pull it off. Or be a girl. I think Berio's glasses are even cooler than Miles' because Luciano's are tinted prescriptions. Nice. Love Miles' three-piece suit, too. Two other books by the prolific Barry Miles that I like: his Paul McCartney bio and his book on Pink Floyd. The Macca book is a little strident about it, but it makes the oft-negelected point that Paul was really the avant-garde Beatle; John was always suspicious of arty sorts and while Paul was living in St. Johns Wood and mingling with Berio and Stockhausen and the like, John and the others were living the stockbroker life out in Weybridge and Esher. Paul's tape piece Carnival of Light pre-dates Revolution 9 by a year. The Floyd book is really good too but really sad, because the disintegration of Syd Barrett is central to that telling. If I could travel back in time I'd go to two places: Vienna ca. 1900-August 1914 and London ca. 1964-early 1967. Happy birthday, Mr. Boulez. I think I'll listen to Repons tonight to celebrate. I wish he'd come back here to Los Angeles to conduct at Disney Hall, but it seems he's winding down his conducting career. Thanks for the reminder, Pliable, though I'm sure there's some who wish Boulez had never been born.